Heroes, traitors, and great thinkers come to life in this activity book, and the concepts of freedom and democracy are celebrated in true accounts of the distinguished officers, wise delegates, rugged riflemen, and hardworking farm wives and children who created the new nation. 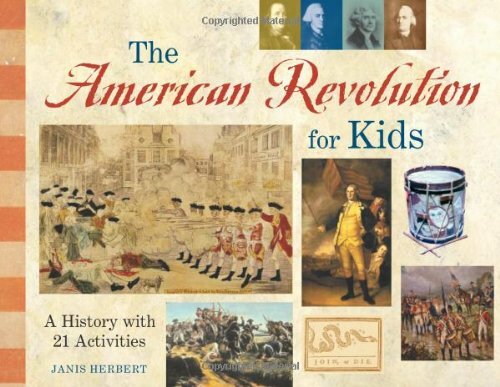 This collection tells the story of the Revolution, from the hated Stamp Act and the Boston Tea Party to the British surrender at Yorktown and the creation of the United States Constitution. All American students are required to study the Revolution and the Constitution, and these 21 activities make it fun and memorable. Kids create a fringed hunting shirt and a tricorn hat and reenact the Battle of Cowpens. They will learn how to make their voices heard in "I Protest" and how Congress works in "There Ought to Be a Law." A final selection including the Declaration of Independence, a glossary, biographies, and pertinent Web sites makes this book a valuable resource for both students and teachers.